Fort McMurray Alberta wildfire forces major evacuation. 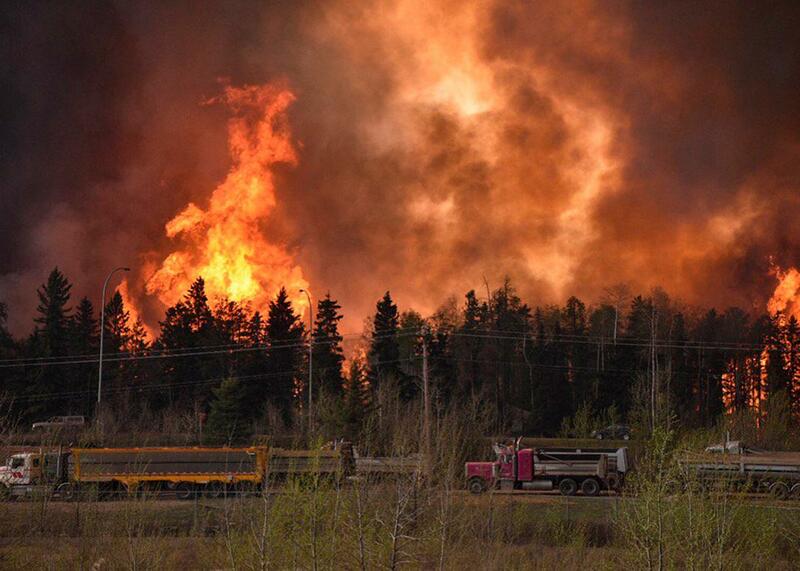 Wildfire Rips Through Canadian City, Forcing 80,000 to Flee. This Is Climate Change. The whole city of Fort McMurray, Alberta, the gateway to Canada’s oil sands region, is under a mandatory evacuation order because of an uncontrolled wildfire that is rapidly spreading, local authorities said on Tuesday. Amid record warm temperatures and an astoundingly dry winter, parts of northern Canada are on fire. It only took a few hours on Tuesday for a wildfire on the outskirts of Fort McMurray—a frontier town in the heart of Alberta’s oil country and the largest city in northern Canada—to explode out of control, forcing the largest mandatory evacuation from a fire in provincial history. More than 80,000 people left their homes according to official estimates. In a worst-case scenario, a large portion of the city could burn, officials said on Wednesday. Fighting back tears, Fort McMurray fire chief Darby Allen told the CBC, “I would say it’s been the worst day of my career. The people here are devastated. … We’ve had a devastating day. Fort McMurray has been overrun by wildfire.” Fire officials say it may already rank as one of the most destructive disasters in Canadian history. Extreme fire behavior on Tuesday was blamed on a sudden wind shift, which helped the fire jump a river and double in size in a few hours time, making it uncontainable, entering the city, which is highly unusual. On Wednesday, officials said the fire had grown overnight, to cover about 25,000 acres (10,000 hectares)—more than five times its size Tuesday morning. Amazingly, as of Wednesday morning, there have been no serious injuries or deaths yet reported, and all fires within the city itself have been extinguished for now—though at great cost to some neighborhoods. The city is not in the clear yet, though, as fire conditions will again be extreme on Wednesday—with gusty winds, high temperatures, and low humidity. In a Tuesday evening press conference, officials warned that the worst of the fire was not yet over, so uncertainty still hangs over the city. This week, a strong atmospheric blocking pattern—a semi-stable extreme arrangement of the jet stream—reinforced an unseasonable heat wave and helped temperatures reach 90 degrees Fahrenheit (32.2 degrees Celsius) on Tuesday in Fort McMurray, 40 degrees Fahrenheit above normal, eight degrees above the daily record high, 15 degrees warmer than Houston, and the same temperature as Miami. While fleeing, some evacuees had to turn on their air conditioners. The evacuation of Fort McMurray was complicated by the fact that the fire itself crossed the only highway running through the city, forcing many people northward toward the oil industry camps that form much of the region’s economic base. I spoke with one Fort McMurray couple in their car a few minutes after they left their house. They were driving north, away from the city, and were planning to stay in one of the oil industry camps serving as evacuation centers. Sirens were blaring in the background as we spoke.